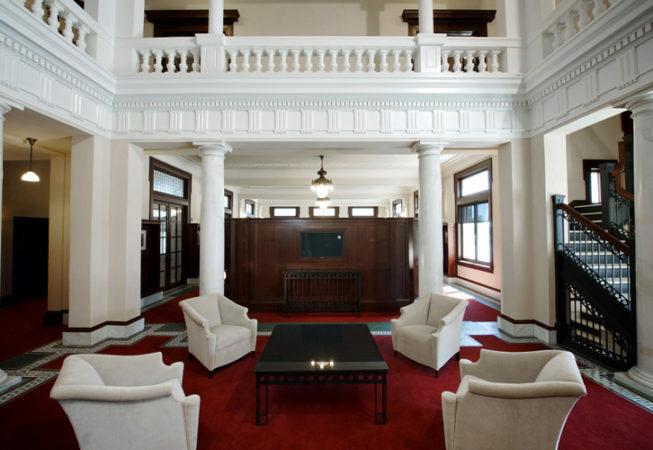 Walking up the front limestone stairs and through the entry doors, visitors to the Wichita Carnegie Library find themselves in the lobby rotunda. A pedestal light hangs above the entry way. Underfoot is a decorative pattern of hexagon and square-shaped mosaic tiles manufactured to replicate the original flooring. 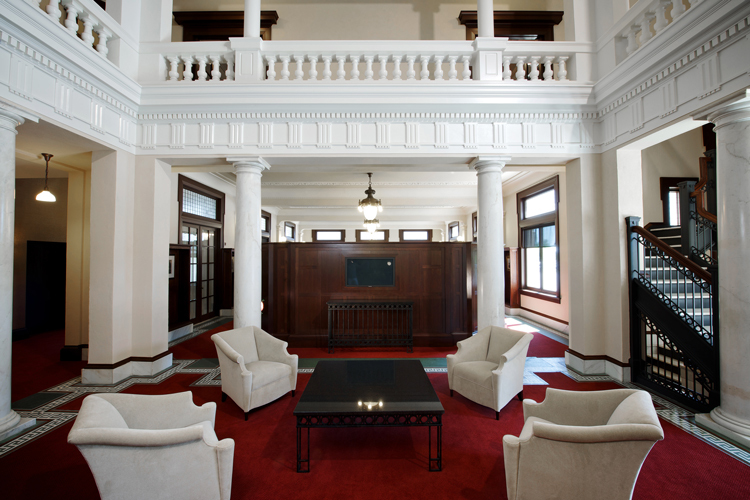 The lobby features a reception desk and sitting area, which includes a coffee table and side table crafted from two sections of discovered railings from the library’s book stacks. A pair of white marble step staircases lead to the second floor walkway, which overlooks the lobby. The rotunda extends above the second floor and is capped by a square domed ceiling. Stained glass windows featuring sunflowers underneath a blue Kansas sky surround the dome. These are replicas of the original windows designed by Elizabeth Stubblefield Navas. A grand chandelier hangs from the center of the domed ceiling. Initially, photos of the original rotunda chandelier could not be found. By luck, an article from a 1916 issue of The New Ladies’ Home Journal included a photo of the lower third of the chandelier. That was enough for artisans to recreate the entire structure to scale. The second floor receives partial support from six marble columns. Two replica columns were created and faux-painted to match the look of marble. Between the two replicas sits a painted plaster frieze dedicated to the memory of Louise Caldwell-Murdock. Originally placed in the center of the south wall in the south wing on the first floor in 1918, the frieze was moved to its position of prominence as part of the restoration. In its totality, the lobby rotunda of the Wichita Carnegie Library reveals the splendor of the historic landmark.